I had a few hours off today so I decided to go work on my boat to try to get the motor running. I failed yet again so I pulled the motor off and loaded it up in the back of my car. 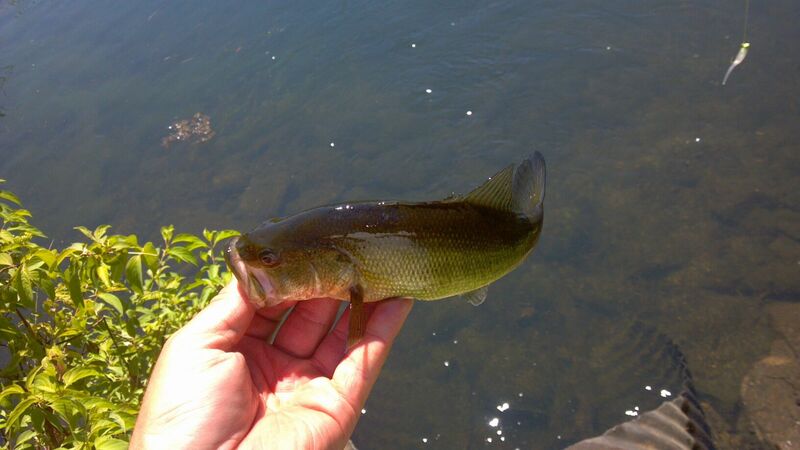 To help drown my misery of boat failure, I decided to go check on a few spots that I have had success with on the Connecticut River. In an unfortunate turn of events this past week, all of my cameras are out of commission. My underwater point and shoot battery charger is MIA, my GoPro took a bath the other day trying to film underwater trout, and my SLR was at work. You would think with several options, one would be working but no… I had to resort to my cellphone camera. Next time I will be ready! The first spot I checked had me very excited! 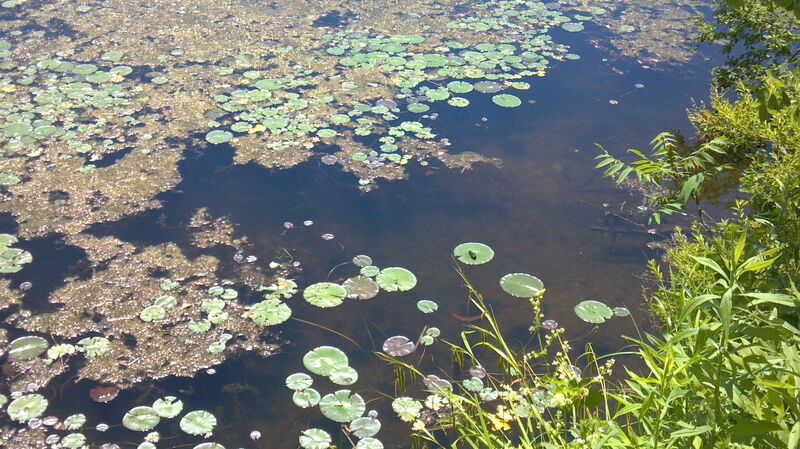 I could see an abundance of gills, bass, and even a few crappie. The hard part was getting them to bite. I tried every bait I had in my box and a wide variety of colors. 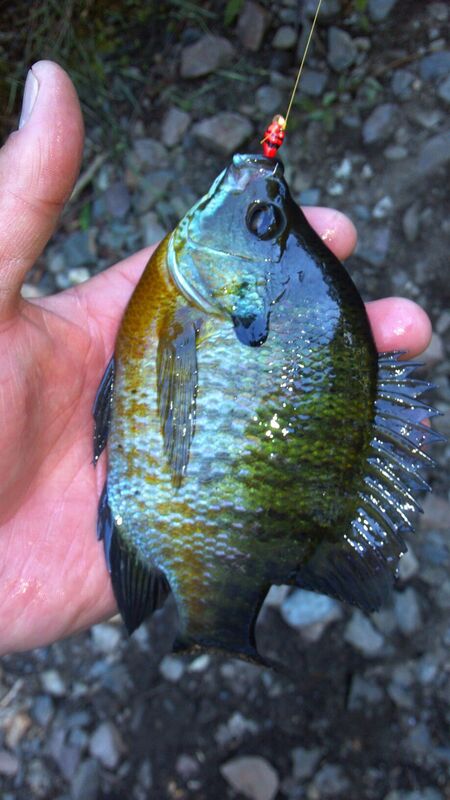 Although I could get the bluegill to nip at it and move it around, none were committing to it and feeding. I could only get bass and perch to take bigger “shad” style baits. I wasn’t surprised that this was happening with the bluegill though as it was mid-day with a bright and warm sun. Check out all these fish! 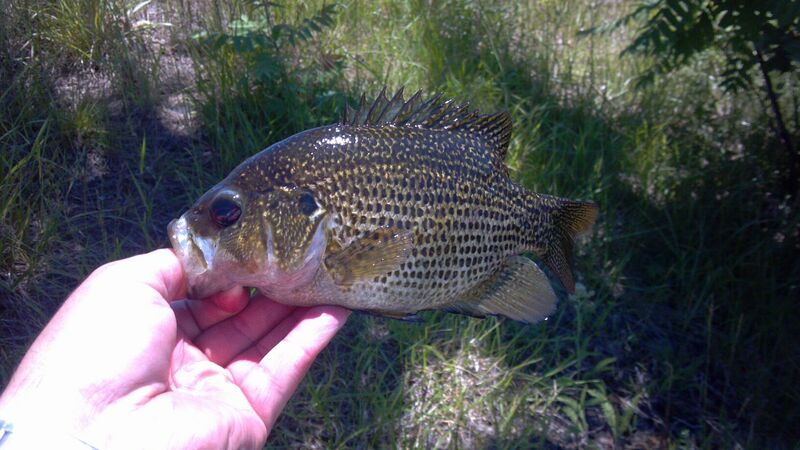 Being that it is summer time and most of the action I have had lately was with crappie, I had left my micro baits at home. Fortunately, I had some J & S Custom Jigs plastics with me. I only had the Gojo Magnum and Ice Mite Magnum though. In order to make the baits more suitable for the finicky fish, I pinched off the thinnest part of the leg and threaded it onto the hook. Growing up, my father always told that fish won’t take the bait unless the tip of the hook is covered. With that lingering in the back of my mind, I covered the entire hook and began catching fish. 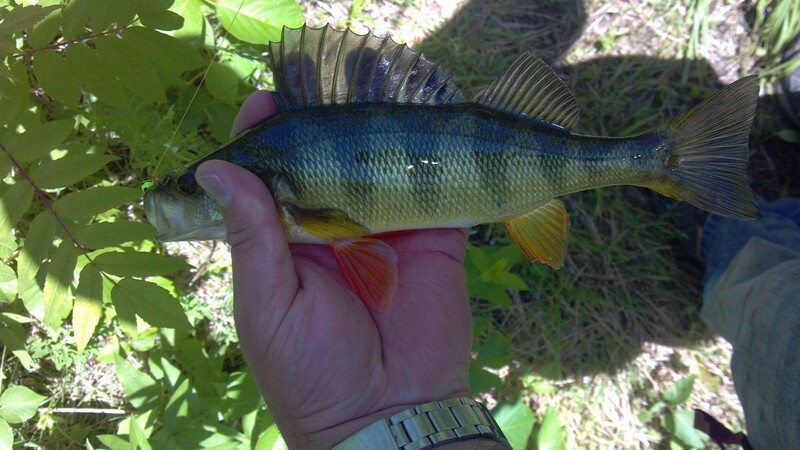 The majority of what I was able to catch were smaller fish but no crappie…. The water was very clear and the fish were super spooky. They were constantly popping at the surface. I think a fly rod would have been very effective if I had planned better… I had to downsize my hook selection to a size 4 Bentley ice jig from a 1/16 ounce lead head. The second spot I tried was a slow moving section of a Connecticut River tributary. 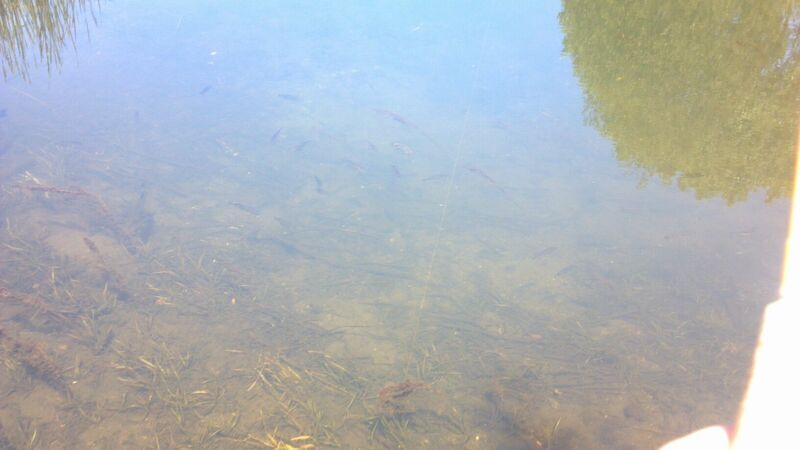 The water was clear and there were a few dozen bass still guarding beds. I picked at a few of them and then moved onto a weed bed that was holding some schooling perch. 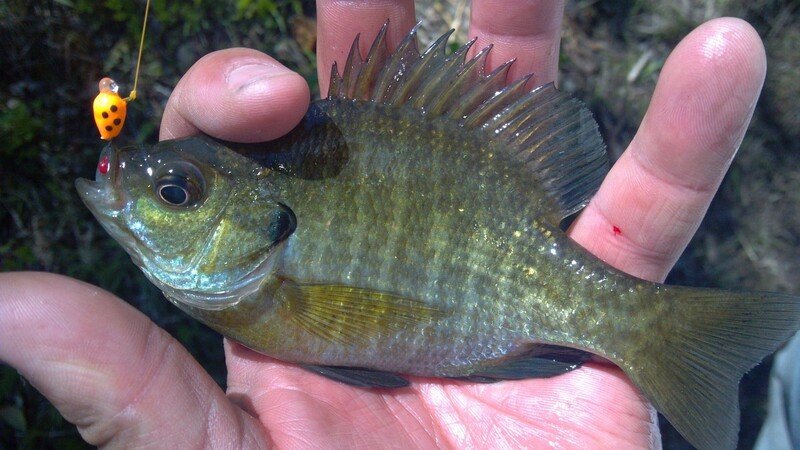 After catching a few of those I moved onto another new species… Rockbass! I haven’t had much luck fishing for these guys lately so I was excited to be able to pull them out of sunken stumps and rock piles. After catching about 35 rockbass sight fishing, I headed further south on the main river. The last spot I hit was absolutely loaded with fish. Many fish were still actively guarding beds even though we had witnessed at least on spawning session back towards the end of April (see 4-26-12 -Mixed Signals). 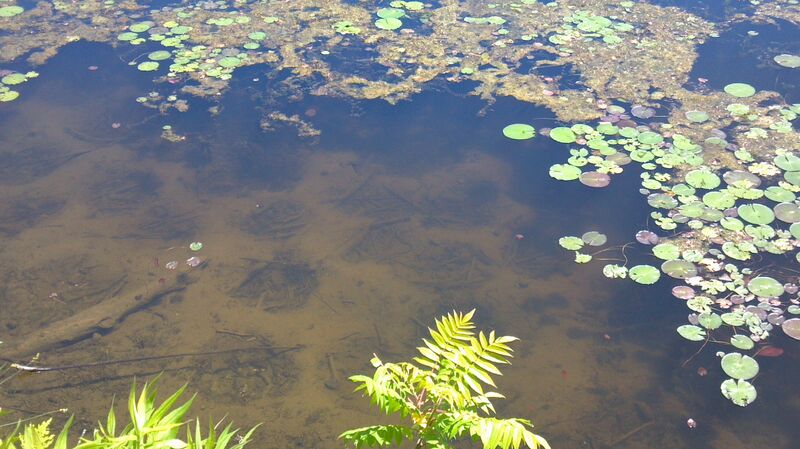 Check out the moonscape created by the bluegill and pumpkinseeds! I even managed to end the day with a nice finger prick by the smallest fish I caught all day! Lucky me!